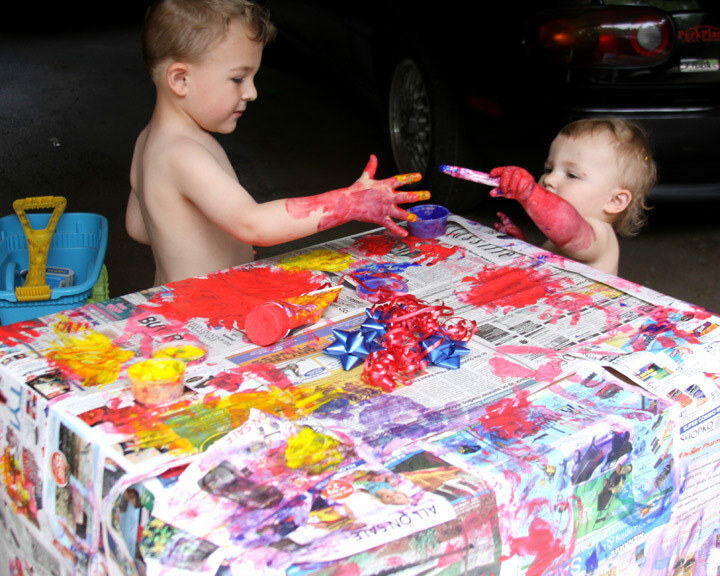 As a stay at home Mom I have learned to turn simple tasks into fun activities for the kids. 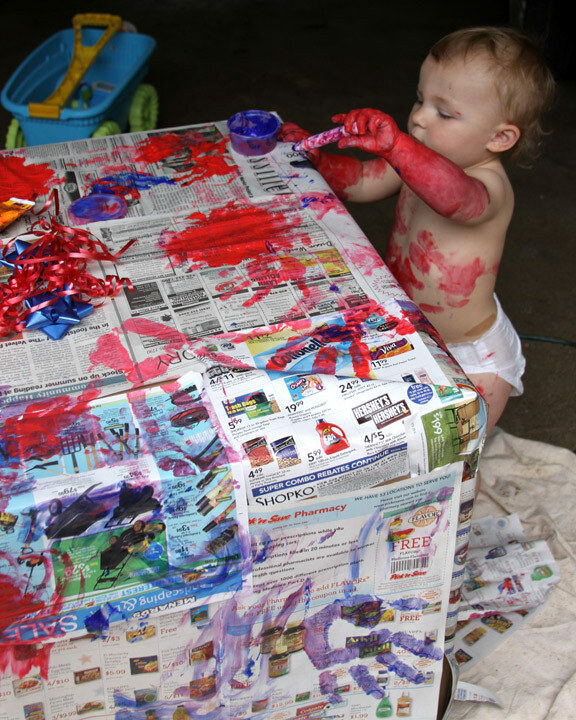 Turn wrapping a present into the most fun that your kids have ever had with paint using newspaper and finger paints. Not only will the kids love every second of it, but the gift will be wrapped in one of a kind paper decorated with tiny hand prints and love from your kiddos. A couple of years ago the kids and I were preparing for my husband’s birthday. We had excitedly saved up some money and bought him a comfy living room chair that he had been wanting. We took the trip to the store and got the gift together, and brought it home just in time for the big birthday celebration. It was then that I realized that I was out of wrapping paper, and by out I mean completely out! Not even enough for a small package, let alone the giant box that held the contents of our chair. Our problem soon turned into one of the kids favorite projects of all time. I quickly gathered the kids box of paints outside where the kids could be free to get good and messy. 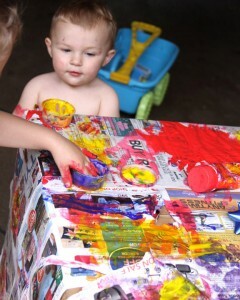 It consisted of all sorts of finger paints, tempera paints, and easy to hold kid paints. They were all washable in case we got any on the driveway, I could just rinse it away. I got a couple of newspapers, and a roll of tape and we were all set for some wrapping fun. 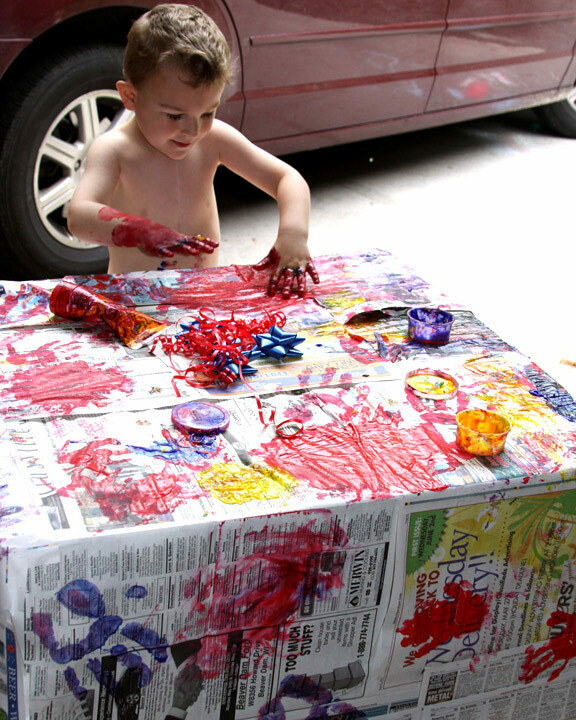 I pieced together pieces of newspaper to wrap the entire box in and opened up all of the paints, setting them out on paper in the driveway. I had all different sized brushes, and a few markers for the kids to paint with. 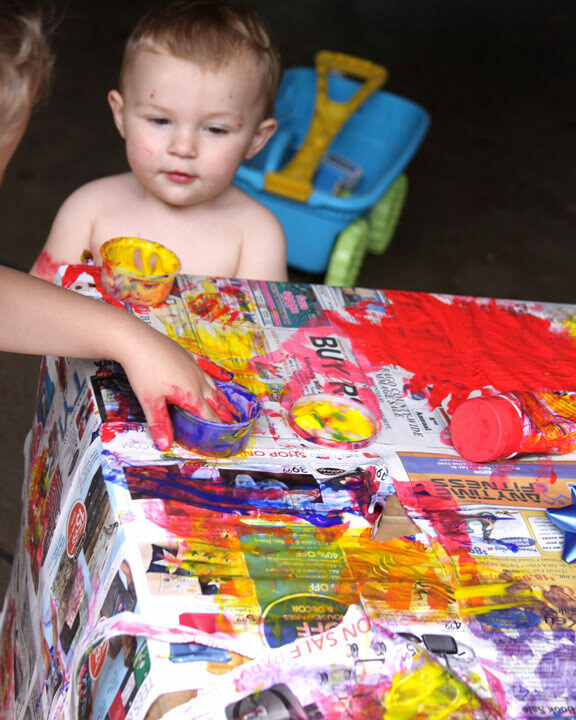 At the time my kids were one and three, and just the sight of all of their paints lined up in a row made them giddy about what was to come. It was a warm and beautiful summer day so I was able to strip them down to their diapers and let them paint. You could always throw on an old over sized shirt as a smock if you wanted to. My plan was to put them in the kiddie pool after we were done painting to rinse them and then head inside for a bath. I gave them the okay to start painting and they both hesitated a little, not sure if I was serious or not. I took a big tube of blue paint and squeezed a bunch into my hands and smeared it around between my hands. Then I promptly pushed my hands against the paper and told them to try it! They were off! The spent the next hour happily decorating the special gift for their Daddy. They were perfectly delighted to cover every last corner of the newspaper with different colored paints. My little girl was literally covered in paint up to her elbows, and enjoyed every second of it. Her favorite thing to do was dip a marker in the paint and then write all over the paper with it. It was perfect for her little hands, and she was so adorable covered in paint. Make sure if your box isn’t terribly thick that you wrap a couple layers of paper over it. My kids had a tendency to saturate one spot completely with paint before moving onto the next, and you don’t want it to seep through the packaging and ruin the gift inside. The kids were more than thrilled for me to drag the package out for their daddy on his birthday! They excitedly pointed to each and every little thing that they had created on the paper and couldn’t wait to see him open the gift. My husband thought that the wrapping was even better than the gift inside, and was happy that the kids had spent so much time and effort making his gift special for his birthday. I was happy that the kids enjoyed the project so much and that my husband appreciated their handiwork as much as I did. The best part was that I didn’t have to spend a cent on a card, or two rolls of wrapping paper to wrap his birthday gift. Using stuff we had at home we were able to do a “project” and wrap a special present at the same time. This can be used for any sized gift, big or small and for anyone that you are giving something special to. What a great way for the kids to take pride in the process of giving to others. Not only can you save money on wrapping paper, but have the kids make a card as well. We rarely buy cards for birthdays or special occasions, because the kids enjoy making their own so much.